I once had the opportunity to spend 72 hours in Tokyo. It’s a gigantic city with more culinary options than should be presented to any human. This being the case, 72 hours was a ridiculously short time and I had to limit myself to brief bouts of sleep, followed by long binges of eating. I was not unsuccessful, but I was a tad tired and very, very full. Of course, I gorged on what you may find typical; your sushi, your tempura, your ramen. But, this gem stood out. I had met the most famous casserole you’ve never heard of. Boil broth. In a heatproof mixing bowl, combine the broth with dried mushrooms. Allow the mushrooms to rehydrate for 30 minutes. In a separate mixing bowl, combine shrimp and half the soy sauce. Rinse the rice until the water runs clear and drain. Set aside the rinsed rice, marinating shrimp, and rehydrating mushrooms. In a skillet, combine 2 Tbsp soy sauce and the remaining ingredients, except for the scallion greens. Once the mushrooms have rehydrated, pour the mushrooms and accompanying broth into the skillet and stir. Bring the mixture to a boil over high heat, add the rice, and stir to distribute evenly. Cover and transfer the skillet to the oven for 25 minutes. 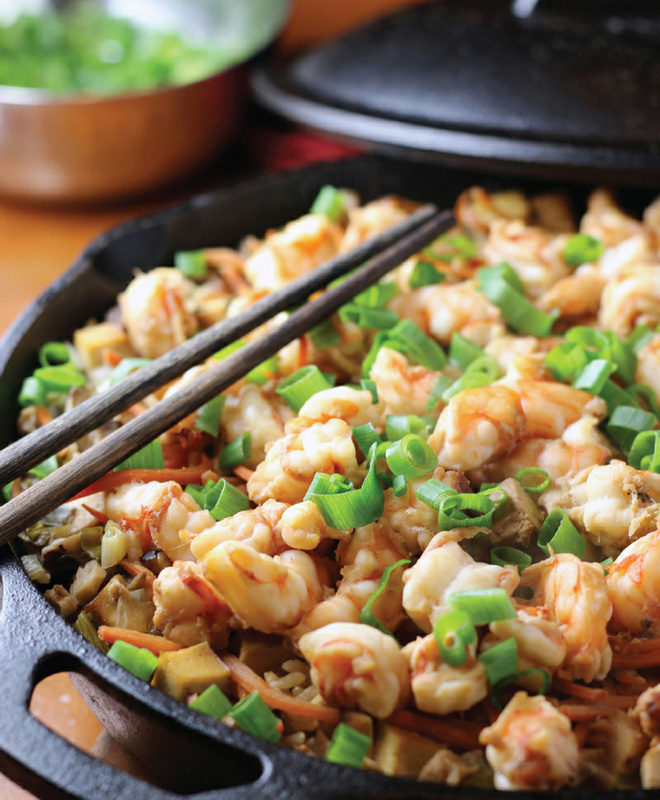 Remove from the oven, carefully remove the cover, and distribute the marinated shrimp across the top of the skillet. Replace the cover, and transfer back to the oven for 10 more minutes. Remove the skillet from the oven. Allow the kamameshi to rest, covered, for 15 minutes. Remove the lid, garnish with scallion greens, and serve directly to bowls.